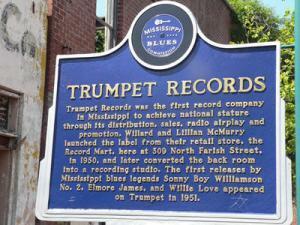 Trumpet Records began it’s existence in Jackson, Mississippi in 1951. It lasted a mere five years, but it’s brief time made a lasting impact on popular musical landscape. The celebrated label had it’s humble origins in a forgotten pile of records in the back of a rented shop. Lillian and Henry McMurry set up their radio repair shop at 309 Farish Street, Jackson, where Lillian found a leftover box of records in a back room. She decided to put them up for sale, and quickly discovered that stocking records could be profitable. They began selling Tampa Red and Big Boy Crudup albums. In 1951, Lillian, whose musical experience was limited to her newly discovered record selling, became an unlikely record producer when the pair officially opened Trumpet, sharing space with their furniture store. 1951 experienced one of the most intense periods of racial segregation in United States history, and Mississippi, one of the most staunchly segregated states in America, was no exception. Through a period where blacks were forced give up their seats simply because of the color of their skin, a humble white woman coordinated with a handful of the most talented black blues men in Mississippi in the ‘black’ part of town to create a sound and style that would resonate through popular music to this day. It didn’t take long for Trumpet to attract major talent, as it was the only record label for hundreds of miles. Blues harmonica great Sonny Boy Williamson (II) began his recording career with Trumpet. While already popular for hosting the King Biscuit radio show, his recordings at Trumpet allowed his career to flourish, and aided in securing him a vocation playing music for the rest of his life. Future bluesman Elmore James, working nearby as a repairman, was brought on to play rhythm guitar for Williamson until he recorded his iconic “Dust My Broom“, which became Trumpet’s biggest hit, reaching number 9 on the Rhythm & Blues charts. Trumpet soon recorded other notable bluesmen, such as Arthur “Big Boy” Crudup, who would later be well known as the writer and original performer of “That’s All Right (Mama)”, Elvis Presley’s first hit. Unfortunately, Trumpet ran across financial problems in the mid fiftys, and after only five years of operation, it succumbed to it’s debts. 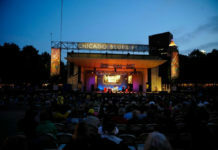 Trumpet’s two biggest stars, Elmore James and Sonny Boy Williamson, moved on to Chicago, often playing on the most famous blues label to have existed; Chess Records. Elmore recorded a number of extremely popular songs such as “Shake Your Moneymaker” and “The Sky is Crying” before succumbing to a heart attack at 45, just 7 years after Trumpet’s closing. Sonny Boy’s record contract was purchased by Chess Records. At Chess, Sonny Boy gained widespread popularity for much of his remaining life. When he passed in 1965, he was buried just outside of Tutwiler, Mississippi. Lillian purchased Sonny Boy’s grave marker. Trumpet recorded some of the most influential blues in the South, from some of the blues’ biggest stars, and left an indelible mark on the development of both rock n’ roll and blues. The music that was created at 309 Farish has strongly impacted and been played by a who’s who of rock stars. Among them; ZZ Top, George Thorogood, The Rolling Stones, Jimi Hendrix, The Allman Brothers, Fleetwood Mac, Eric Clapton, The Beatles, and many others. The label helped give black artists in the south a voice, when places to do so were scarce. At the time, there wasn’t a recording studio in the American South, or even nearby. Trumpet had briefly filled that gap by constructing a studio in the back of a humble radio repair store, where blues artists made prolific, lasting recordings. There is now a marker on the Mississippi Blues Trail in front of 309 Farrish St. where Trumpet Records used to reside. Unfortunately, while there are plans to revitalize Farish, the street and the building are in extreme disrepair, and the area is generally unsafe. While the building is unassuming, the music has withstood the test of time. Previous articleSorry for the Wait, Blues Fans — We Have Returned!